A WiiWare download game released exclusively to Club Nintendo members in the US and Japan. You control the Ultra Hand (a classic Nintendo toy from 1966) as it stretches out to grab cooked meat from barbecue grills. You have to wait until the food is cooked and don't let it burn if you want a high score. In the single-player mode, the goal is to keep playing until you lose. 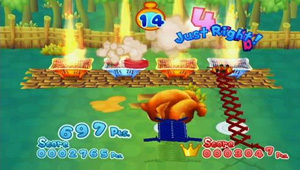 In the VS. Mode, two players compete for the highest score in 90 seconds.